so glad to see an interview with this author! 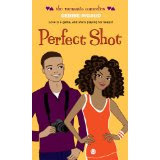 really looking forward to reading PERFECT SHOT, i wish i'd had books like this when i was younger. extremely glad to have it now. pam and london's relationship sounds so good, and...volleyball! and it's a great one, doret. i'm looking forward to the interview on Haiti -- and more from Debbie Rigaud. I hadn't heard of this book until reading this interview. I have some students who I know would love this book. Gbemi - I was glad I had the chance to ask Debbie a few questions about Haiti. I am confused. You start off by saying the author is Hatian American and then refer to her as African American in your interview. With all that is going on in Haiti right now, would it be encouraging to be known as a Haitian/American? Black Americans and Haitians are both of African origins. But, that's not so much what the interview is about. I think that's going to be on another blog. Doret, I enjoyed this interview so much! I remember your excitement when you first mentioned this book! I'm glad you were able to connect with Debbie. I think instead of going to Amazon, I'll go to the bookstore and request it this weekend so they can be introduced to this book as well! This interview was encouraging to me in a few ways. First, I have always been a lover of reading but as a YA I had very few, if any, characters that looked, talked and went through similar things as me and my family. I'm so excited read this and pass it along to others! Second, as a writer myself, I'm encouraged to see a female author of color trailblazing for people like me. You have one more loyal follower Debbie Rigaud! Doret and Debbie, thanks so much for the shout out! I love the S&B Chick Lit idea. I'm about to go on a ski trip (I am not making this up!) but when I get back, I'll do my part by blogging about it. I'm so grateful for this feature. Thank you, Doret. I just won Perfect Shot in a contest! I totally can't wait to read and review it, it sounds so cute, and seriously, who doesn't get sucked into those ANTM marathons on TV, or the Tyra Show for that matter. Also, Debbie sounds awesome, am looking forward to more of her books! I'm so grateful we have Perfect Shot and I can't wait to see what Debbie comes up with next! I will totally add S&B chick lit to my future reviews. Pam was an amazing character, <3 HDQ! @April-I think you will really enjoy Perfect Shot, congrats on winning a copy!